The Bureau of Labor Statistics came out this week with their latest jobs report. 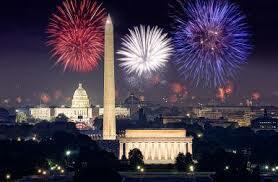 President Obama hailed the drop in the official unemployment rate and wants to celebrate it with fireworks. Conservatives looked at the same data and concluded it was a massive dud or worse, the entire fireworks assembly to be fired on the Washington Mall tonight exploded before being fired. How can that be? 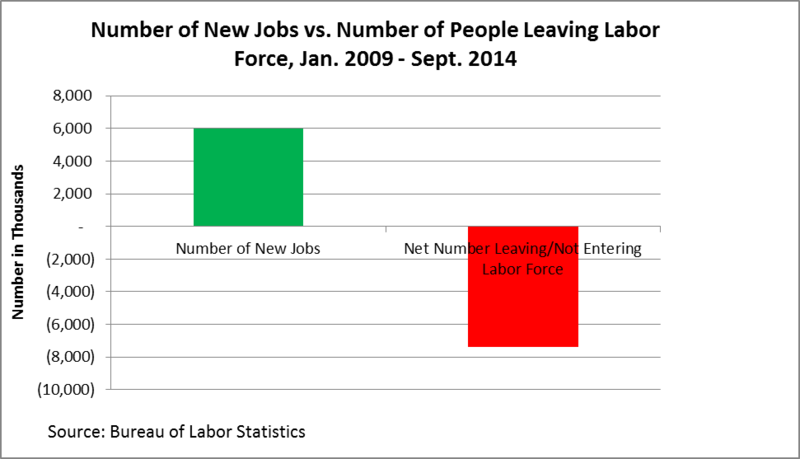 How can the jobs report be so confusing that it can produce such very different conclusions? First of all, a little history lesson about the Fourth of July in case you may have missed it before. John Adams, our first Vice-President under George Washington and our 2nd President, wrote a letter to his wife Abigail after the conclusion of the writing of the Declaration of Independence. He dated his letter to her on July 3 and said the following about July 2, the day the delegates to Philadelphia approved the Declaration: 'The Second Day of July 1776, will be the most memorable Epocha, in the History of America'. Because there was no internet in the day, or CNN or FOX or MSNBC, it took awhile for his letter to get to her. Plus, the Declaration was transposed into its final form and 'July 2' was scribbled out and 'July 4' was printed as the official date it was approved. Anyway, fireworks have been a part of the American experience since Day 1. 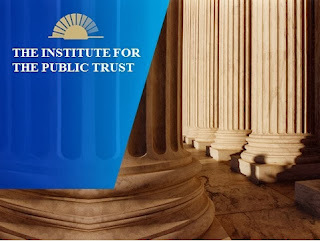 They are not expressly talked about in the US Constitution, although there are plenty of 'fireworks' in that document as well as evidenced by some of the Roberts Court decisions in recent times, yes? Here is the latest jobs report from BLS. Read it for yourself and decide if you think it is a beautiful display of job growth creation success or a dud that blew up on the launching pad. Or neither. The Obama Administration touts the fall in the official unemployment rate to 5.3%, down from the high of 10% in October of his first year in the White House in 2009. They also hailed the drop in the number of officially 'unemployed' workers by 375,000 to 8.3 million total, down from 11.6 million in January, 2009. Which looks good on the face of it, doesn't it? How can that be a good thing? 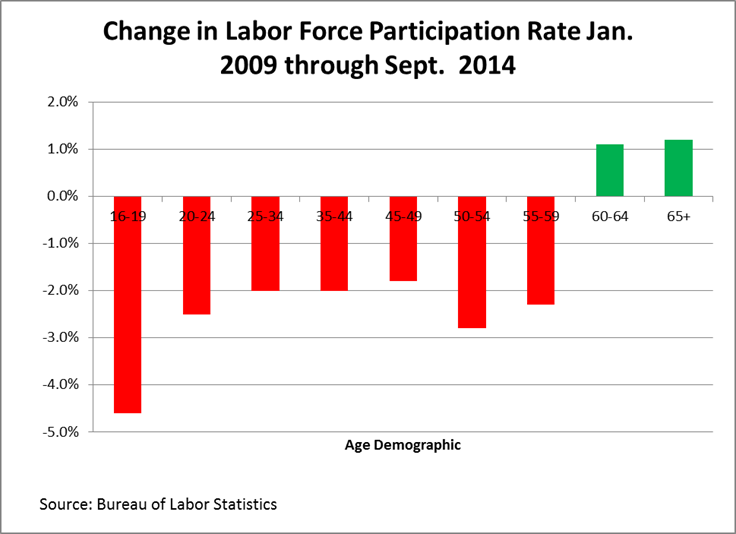 The labor force declines when people retire or stop looking for work altogether. You can't be counted as 'unemployed' if you are no longer looking for work. 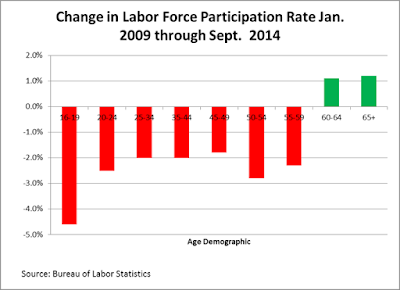 The labor participation rates across the board almost are now at their lowest rates since 1978. 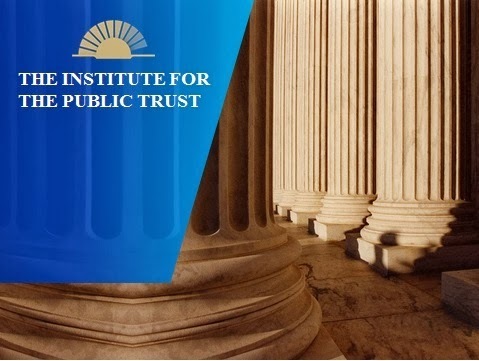 Before millions of women started to enter the workforce en masse and create the truly great acronym for the IRS to use to describe those couples who worked, DINK (Double Income, No Kids). It is so hard to get your mind around these dull data points. So we are borrowing some important and telling charts from Stephen Moore from an article he published in Forbes Magazine in 2014. Here's the most troubling aspect of this so-called 'recovery' since 2009: There just don't seem to be a lot of great jobs being created out there, does it? As a result, the first chart tells us that millions of younger Americans are not just not finding a job, they are dropping out of the workforce altogether. Those 16-19 have dropped out the most, right when they really need to find a job, ANY job, to learn the skills and discipline needed to get a better job as they grow up and get more training and education. Let's face it: in an ever-increasing technological America competing with countries across the globe for business, a young person with no education, training or job experience is going to have a hard time making it on his or her own. Perhaps the most troubling chart is the second one that either Mr. Moore or some plucky assistant gleaned from the dull BLS reports because government doesn't usually offer their data in such clear and graphic and colorful detail that is pleasing to the eye to see. 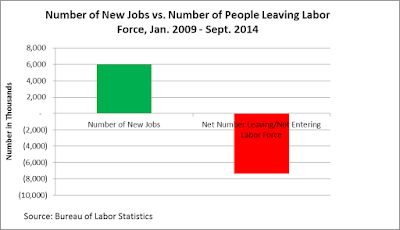 The number of new jobs touted by the Obama Administration as having been created under his watch, as of September 2014, was about 6 million new jobs. Not bad on the face of it. However, the number of people leaving or not entering the workforce, as in the case of the younger folks noted above, has been about 7 million people since September 2014. That can't be good under any circumstance, can it? People leaving the workforce means less demand for goods and services and the ability to pay for them, right? Many of these people are aging Boomers. We get that. We are right there in it with them. But many are not. Many are aging Boomers who want to keep working, or as evidenced by the fact that Boomers are the only age cohort that has seen an increase in the labor participation rate since 2009. So expect to see Aging Boomers hang onto their jobs as long as they can. Which also frustrates younger workers who would like to see them retire so they can take over their jobs. So which is it in your eye? Is the latest jobs report a fireworks display of amazing color and celebration of the American spirit....or has it shown that our policies of the past 6 years have exploded on the ground in their cases? Happy Fourth of July regardless. We still think John Adams go it right.